As a 30-person imaging core lab, Medical Metrics Inc. (MMI) works hard to get the job done. But sometimes, getting the job done leaves room for little else. Although it had been operating under an existing quality management system (QMS) structured to meet Food and Drug Administration (FDA) regulations, increasing efficiency was considered outside the scope of regulatory agency requirements. MMI found it lacked an organization-wide framework in place to analyze and improve the business. That’s why MMI decided to implement ISO 9001:2008 Quality management systems – Requirements—to not only get the job done, but to get the job done better. -Medical Metrics Inc. (MMI), had an existing quality management system structured to meet FDA regulations, but it was missing a framework to help drive organization-wide improvement. -MMI worked with an external consultant to create an integrated management system—a fusion of regulatory requirements with the ISO 9001 framework—and received certification to the standard in less than seven months. MMI continues to make its quality management system stronger after passing the audit. -Though MMI’s certification is recent, it is already seeing improvements to the timeliness of deliverables to clinical trial sponsors. MMI also reports an increase in quality awareness from the ISO 9001 implementation and has received positive feedback from sponsors. 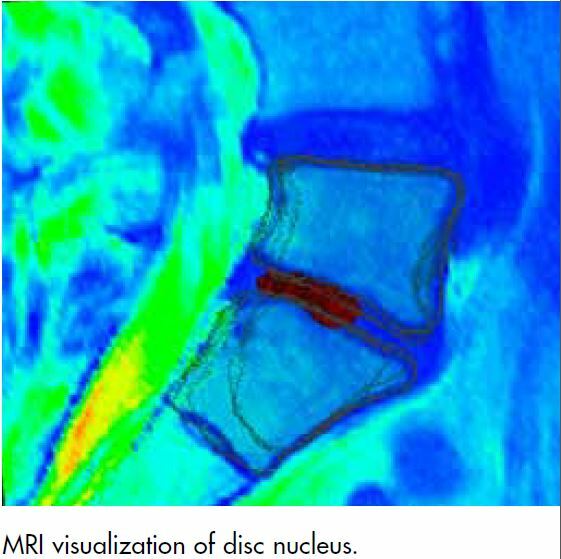 MMI is a provider of independent imaging core lab services for clinical trials of medical devices, drugs, and biologics based in Houston, TX. Since 2000, the company has partnered with clinical trial sponsors on more than 300 investigations and research studies across a wide range of therapeutic areas. 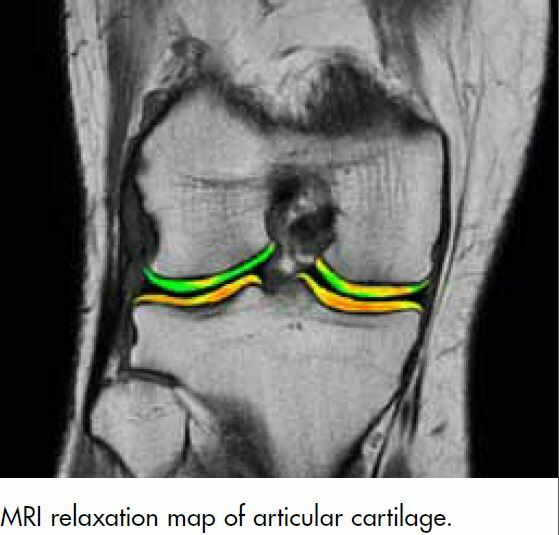 Its services include imaging protocol development, medical image management, expert image review, and scientific interpretation. 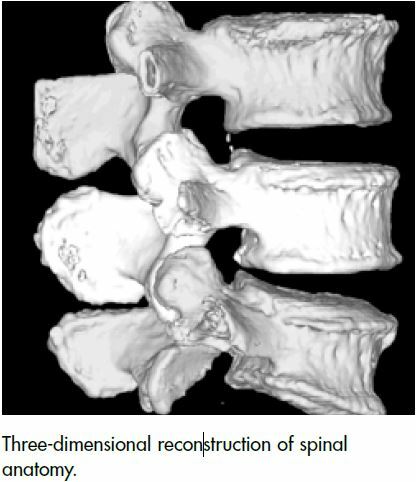 MMI’s areas of expertise include orthopedics, spine, neurology, cardiology, and vascular medicine. MMI supports domestic and multinational clinical trials ranging from early-phase clinical testing to post-approval surveillance. Participation in regulated studies has resulted in numerous product approvals, including several “first to market” products. In addition to regulatory requirements, MMI must meet the quality system standards of large multinational organizations that have stringent vendor evaluation programs. Before taking on new studies, trial sponsors (MMI’s customers) require MMI to complete supplier questionnaires. MMI found almost every questionnaire included a question as to whether MMI was ISO 9001 certified. While MMI’s interest in ISO 9001 certification was not imposed by a sponsor, compliance to the standard would give the lab an edge in the industry. Senior management supported ISO 9001 certification from the beginning and elevated the project to an organizational priority. Tom Martin, president and CEO, felt ISO 9001 certification would communicate the company’s customer focus and a commitment to continual improvement. “Without a comprehensive QMS, we cannot be sure that we are meeting our customers’ needs. We also cannot be sure that we are working on the right things without understanding the overall organization and how it is performing in our customers’ eyes. The quality system helps us focus on what is important,” Martin said. Certification to ISO 9001 means that an independent authority has assessed and approved an organization’s management system against the standard. MMI had an existing quality system infrastructure in place based on 21 CFR Part 812, 21 CFR Part 820, and 21 CFR Part 11 regulations because of MMI’s clinical trial participation and because it utilized proprietary technology for analyzing radiographic images. The existing system underwent several FDA visits and numerous sponsor audits that contributed to continual improvement, but this improvement was primarily limited to software validation and data management. What was missing was a company-wide framework to identify real and potential deficiencies to improve upon. Knowing that it lacked the internal expertise to implement ISO 9001 and not wanting to delay services to clients, MMI selected external consultant Gretchen McAuliffe, principal consultant of Labtopia, to lead the project. In McAuliffe’s initial discussions with MMI, they contemplated two separate quality systems—one based on FDA regulations and one based on ISO 9001. She proposed a structure where ISO 9001 encompassed the entire organization, forming an umbrella quality system that included all FDA regulatory requirements. 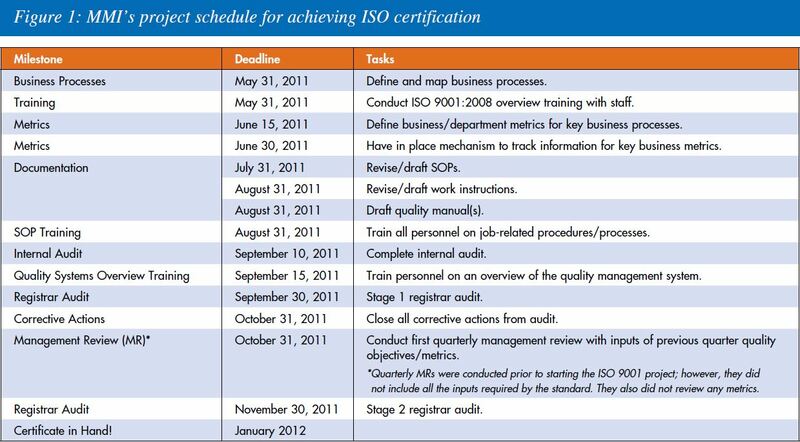 MMI planned to achieve ISO certification in less than seven months, an aggressive timeline guided by a clear project schedule (Figure 1). MMI attributes its rapid certification to weekly QMS meetings for the core implementation team—which consisted of senior management, department managers, and the consultant—to discuss the status of tasks and to identify areas where additional resources were required to meet goals. MMI created time to focus on the quality system, discussed issues and delays, and allocated resources when necessary so bumps wouldn’t become roadblocks. Since ISO 9001 was a new way to do business, MMI also involved more staff to actively participate in implementing the quality management system than it would have historically. This helped send the message across the organization that quality is no longer solely the responsibility of the quality management representative. McAuliffe explained that preparing MMI for ISO 9001 was a change management issue. The organization readily embraced the QMS, but lacked the discipline or understanding on how and when to use the system (i.e., documenting a complaint, entering a nonconformance, etc). Throughout the implementation, McAuliffe trained staff on how a QMS functions and what its requirements are, and made sure they were kept informed of developments to procedures and processes. 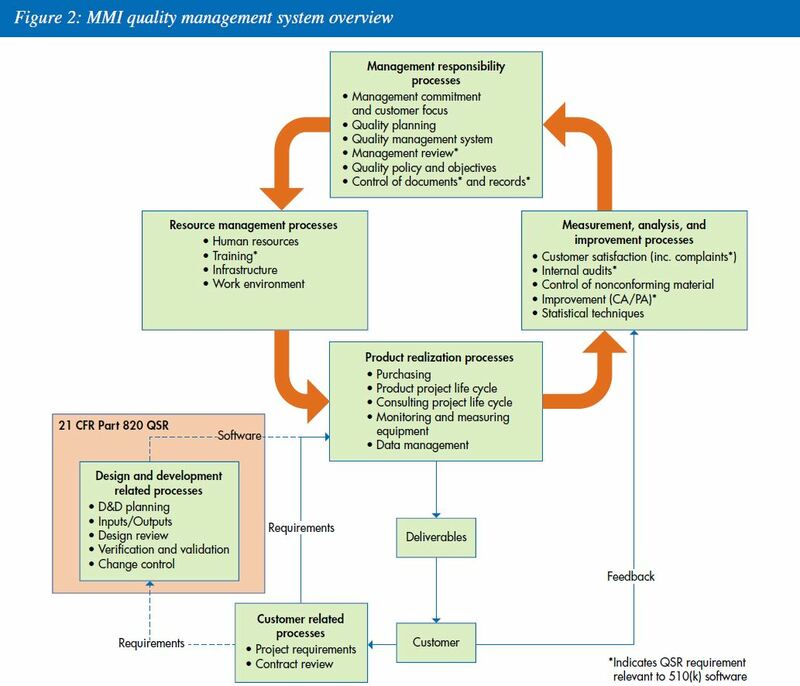 McAuliffe said since a quality system infrastructure was in place, implementing ISO 9001 and integrating it with the FDA requirements was essentially “taking what was there and making it better and more automated.” MMI’s integrated management system is shown in Figure 2. One of MMI’s first steps toward ISO 9001 compliance was to conduct a gap analysis to reveal areas for improvement in the existing system. In many cases, processes and requirements had already been defined, but documentation was either outdated or the processes did not always reflect current operations. Because of this, much of the existing documentation had to be rewritten. A document control structure was established early in the journey using an alpha-numeric numbering system. McAuliffe and the management team created common document templates that were used to collaborate with process owners in defining and documenting processes. The company’s business development and technical services groups experienced the most process development. MMI had an existing quality policy that was broadened to include ISO 9001 requirements, such as continual improvement. This spring boarded improvements to MMI’s quality objectives. Quality objectives were largely driven by customer satisfaction, and MMI felt this focus was the best way to continue. However, MMI needed to establish parameters around where and how objectives would be tracked, the frequency of measurement, goals, and when metrics would be reviewed. For most of the objectives, MMI added new fields to the existing customer relationship management (CRM) system so performance was more visible. Customer requirements were already clearly defined under the existing system. MMI operates under a “schedule of work” for each project. The schedules are akin to project plans and typically entail 15 to 20 pages of documents outlining the scope of work, which is defined by the sponsor’s clinical protocol, which receives FDA approval. With design and development of the QMS completed, the next step was to continually improve it based on internal and external feedback. Senior management began holding weekly quality meetings to review complaints and nonconformances. An internal audit also provided a more formal and comprehensive assessment of opportunities to improve. To seek external feedback, MMI shared its QMS with sponsors. The quality manual proved to be an especially useful tool to show sponsors how MMI “does business”—its conformance to ISO 9001 and regulatory requirements. MMI also implemented a customer satisfaction survey. Initially, a beta survey was sent to 20 contacts that MMI identified as “friends of MMI.” MMI used feedback from the pilot to adjust the survey accordingly before sending it to all existing customers. 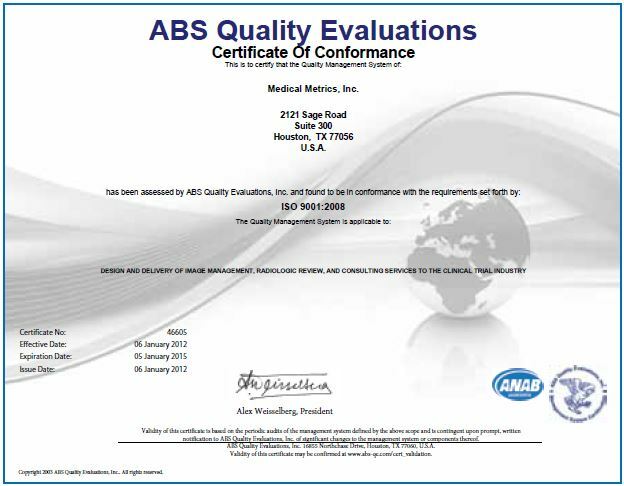 MMI reached its goal of attaining ISO 9001:2008 certification in less than seven months—the final, stage 2 audit from ABS Quality Evaluations occurred in November 2011 and MMI’s ISO 9001 certificate was in hand by early January 2012. In 2012, MMI will further define and refine its processes and develop metrics to make them more granular—especially those that involve multiple, interacting departments. There are still some key business processes that the lab plans to further document and develop into standard operating procedures. The company plans to involve customers as it further develops its QMS. MMI is currently working with a key customer to further develop a process for delivering data. This program will eventually be evaluated by a second tier of customers before becoming a standard practice at MMI. Another goal of MMI is to use its Web-based CRM to manage multiple aspects of the business, including the QMS. The primary reason for this move is that the CRM has the capability to integrate workflow, email notifications to personnel, and it will allow for a substantial improvement in reporting. Likewise, the CRM will help MMI meet the 21 CFR Part 11 requirement and will be able to be validated, which is a regulatory requirement for the customer complaint and corrective and preventive action (CAPA) system. Plans are under way to integrate some processes, such as quality and production, into its CRM. The CRM serves as the daily project dashboard. Fully linking the QMS with the CRM will allow personnel to review quality action items, CAPAs,and complaints as a matter of their daily business. This will allow issues to be visible to everyone in the organization and will reinforce that the QMS is not a separate entity. While MMI has come a long way in a short amount of time, ISO 9001 certification is just the beginning to a new way of doing business. “Registration was just the start, now we have to manage, improve, and develop the system,” Martin said. Because its certification is recent and the QMS is still in its infancy, MMI said the bottom-line impact has yet to be fully evaluated. However, MMI saw improvements to two of its key metrics during third and fourth quarters of 2011—more than 90 percent of its deliverables to sponsors were on time and more than 90 percent of its business proposal submissions were on time. McAuliffe anticipates that MMI will further refine its objectives and see improvements as the company continues to set the bar higher. “It’s about learning to crawl before we can walk,” McAuliffe said. Management review meetings are an integral part of monitoring, evaluating, and improving a QMS. McAuliffe said the results of the company’s first management review meetings were a bit shocking to senior management. “Having the results for performance on key criteria was an eye-opening experience. Often, I find companies cannot see the forest through the trees, and having the actual hard data, which is a clear indicator of performance, is critical to quality improvement,” she said. Once senior management saw where the actual issues were, they were able to implement corrective actions and saw remarkable improvement over the next quarter. Information from key, identified objectives and metrics are reported to the board of directors during quarterly meetings. Personnel are kept informed of monthly and quarterly objectives through a quality bulletin. It includes results of recent audits, upcoming audits, performance metrics, and minor procedural notifications. To learn more about MMI and the services it provides, contact Michelle Council, director of business development at 713-850-7500 x211 or mcouncil@medicalmetrics.com or visit www.medicalmetrics.com. For more information about MMI’s ISO 9001 implementation, contact Gretchen McAuliffe of Labtopia at 281-619-2600 or gmcauliffe@labtopiainc.com. 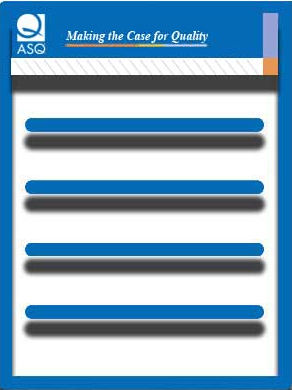 Read more articles about quality applications in the healthcare sector at asq.org/healthcare-use/library/overview.html. Learn about ISO 9001 at asq.org/learn-about-quality/iso-9000/overview/overview.html. To view this and other case studies, visit the ASQ Knowledge Center at asq.org/knowledge-center/case-studies. Megan Schmidt is an ASQ staff writer.